When we say that we offer ‘bespoke wood flooring’ we really do mean that it’s possible to have something unique for your home or business. Every floor we install is made to order. We do not have stock; our workshop is full of planks that are going through different stages of treatment to become a ‘one-off’ floor, finished the exact way the client wanted it. Here we outline the different ways in which the appearance of your floor can be tailored to your specific requirements. Pick Your Grade – Rustic/Natural or Prime? 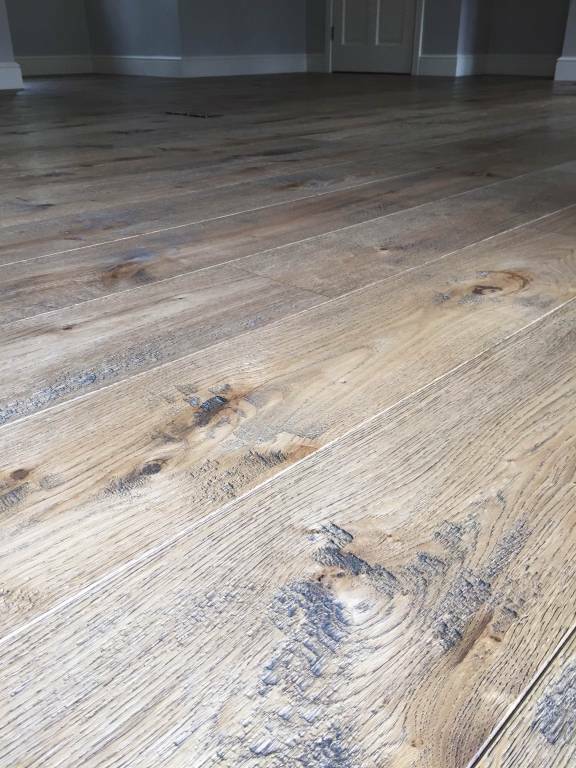 When used with reference to wood flooring, ‘grade’ means the appearance of the grain: basically how many knots are likely to be in the average plank. ‘Rustic’ (or ‘natural’) grade both mean the same thing: planks will have various knots within them. A ‘prime’ grade plank will have been selected to have no knots. It’s important to know that the presence or absence of knots is a visual difference only. There is absolutely no difference in the quality of the plank. Rustic grade planks are just as strong, and just as stable (resistant to moisture) as prime grade. In fact, a knot is actually a tougher and more compressed part of a piece of wood, one which is harder to distress or cut through. Prime grade is more expensive only because it involves a selection process – you’re paying for the extra time involved. 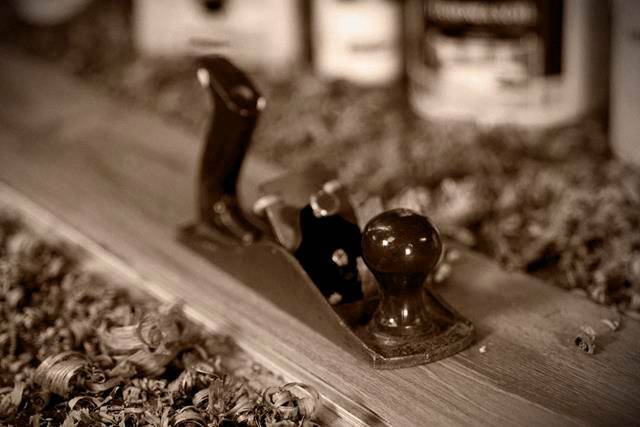 We currently offer both natural and prime grade for Ash, Oak, and Walnut. Natural grade is the only option for both Maple and Wenge. It has been known for centuries that subjecting wood to heat changes its properties. Woodcraft are able to offer thermo-treatment as a pre-finishing option on Oak currently. It makes the wood visibly darker. This unlocks the potential to create radically different colour finishes in Oak. There are two options here: what we call either a ‘six hour fume’ or a ‘twelve hour fume’ (with the twelve hours being darkest). Does it damage the wood in any way? No – it actually makes the wood stronger and more resistant to both moisture and fungus. The wood is placed into a special oven and then heated to a very high temperature, with steam used to stop it burning or cracking. No chemicals are used. 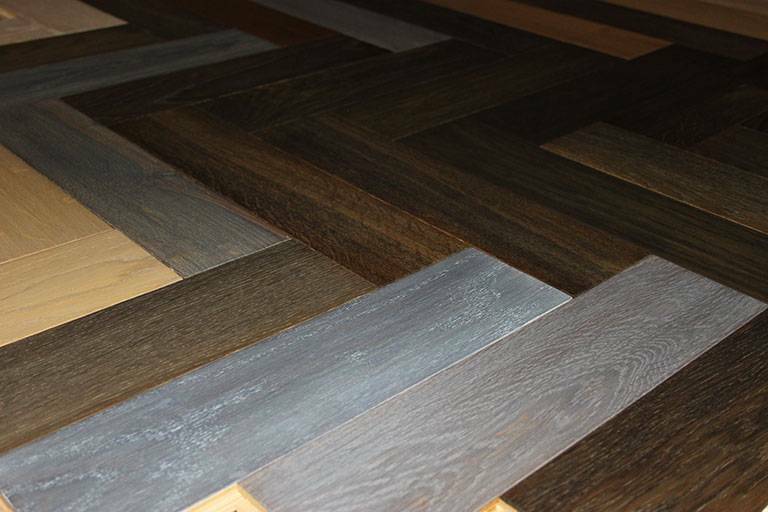 We offer thermo-treatment as an option on engineered products (both parquet and planks), but only on Oak. The treatment is carried out at our Oak supplier’s premises in the Ukraine. the board will be ‘buffed’ (sanded using a very fine grain paper) to remove splinters and smooth the surface. Needless to say, there are different types or levels of distressing as the process is under Mursel’s control. However, the harder the wood, the more time-consuming (and therefore expensive) it is to distress. We would definitely not recommend that Wenge or Maple be distressed, and Walnut and Ash are also hard work. Our advice would be to stick to Oak if you want a distressed or aged wood floor. Your floor will need to be finished, and there are two options: lacquer (varnish) or hard wax oil. Lacquer is a coating only and it preserves the existing look of the wood; hard wax oil also preserves but it will colour the wood too. There are a number of differences between the hard wax oil and lacquer and these need to be explained. We are not particularly keen on lacquer as a finish for wood because, to our mind, it has a number of disadvantages compared to hard wax oil. First, there’s no ‘spot maintenance’ product or technique for lacquer, so a scratch on a lacquered floor cannot be easily repaired. It’s necessary to sand the whole area, then re-apply the lacquer. With a hard waxed oil floor, a skilled repairer can sand only the scratched area and then re-apply the hard wax oil and blend with the rest of the floor. Second, lacquer tends to discolour if exposed to strong sunlight – for example, near a very bright window or in a conservatory. The hard wax oils we use are UV resistant. Last, lacquer tends to flake over time, and eventually it will need sanding and completely re-finishing (usually after three years). With hard wax oil it is possible to apply maintenance product (a light oil) every year to refresh the look, and no other treatment is required. The hard wax and UV oils we use are all environmentally-friendly. Hard wax oil is our preferred finish because it does not just act as a more flexible preservative, but also opens up the possibility of wonderful and endless variations in the colour of your floor. We do not use ‘stains’ (water-based or otherwise) because we have found that these products do not achieve the same rich colours. We can buy hard wax oil in more than 200 different colours, many of which also have different finishes: satin gloss, clear satin, semi-gloss, semi-satin, semi-matt and matt. Hard wax oil should usually be applied with three to five coats, each coat being an application of the product to the surface of the board by hand, with time for the wood to absorb the finish. Typically this process takes two to four weeks. If you visit our factory showroom and workshop you’ll have the opportunity to view hand-finished planks on our drying racks. Because it is possible to use different colours for each of the three to five layers of hard wax oil, a huge range of different finishes can be achieved. Mursel is always experimenting with colour finishes, and many of the looks that can be achieved are our own trade secrets.